Dinosaur and prehistoric animal skeletons T. rex, Triceratops, Brachiosaurus, Parasaurolophus, Stegosaurus etc. Twelve different prehistoric animal skeletons in this set. Great for teaching resources and for imaginative play. Dinosaur and prehistoric animal skeletons T. rex, Triceratops, Brachiosaurus, Parasaurolophus, Stegosaurus etc. Twelve different prehistoric animal skeletons to collect. Great for teaching resources and for imaginative play. Robust and sturdy, dinosaur fossil skulls such as T. rex, Triceratops and Diplodocus. Ideal for school or home study projects. Can you sort the herbivores from the carnivores? A pack of 48 models of dinosaur skulls. 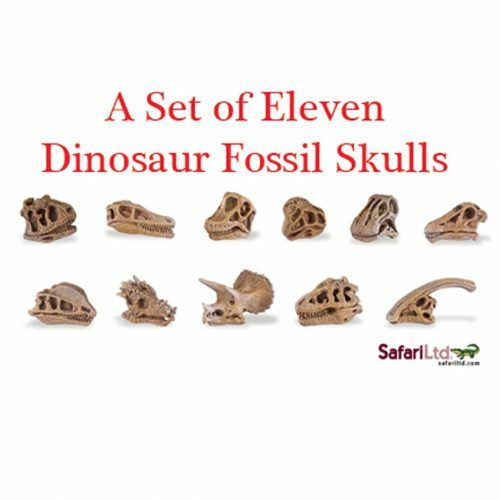 Eleven different types of dinosaur fossil skull in this pack including T. rex and Triceratops. A great resource for schools. A set of eleven different models of dinosaur skulls including Diplodocus, Triceratops and T. rex. Can you sort the Jurassic dinosaurs from the Cretaceous dinosaurs? A great model set as a teaching resource for schools. A box featuring real fossils. A set of fossils to start off your very own fossil collection. Set features Ammonites, sharks teeth and crinoids amongst others. 290 million years of geological time in a box. Hours of fun for any budding palaeontologist, a Fossil Finds Stegosaurus dinosaur kit. Excavate a complete mini Stegosaurus skeleton out of the plaster block using the specially designed digging tool. Assemble the pieces and construct your own model. Collect and display the entire museum collection. Hours of fun for any budding palaeontologist. A Fossil Finds Tyrannosaurus rex. Excavate a complete mini T. rex skeleton out of the plaster block using the specially designed digging tool. Assemble the pieces and construct your own model. Four models in the series to collect and display. Hours of fun for any budding palaeontologist. A Fossil Finds Triceratops dinosaur. Excavate a complete mini Triceratops skeleton out of the plaster block using the specially designed digging tool. Assemble the pieces and construct your own model. Four models in the series to collect and display. Hours of fun for any budding palaeontologist. A Fossil Finds Velociraptor kit. Excavate a complete mini Velociraptor skeleton out of the plaster block using the specially designed digging tool. Assemble the pieces and construct your own model. Four models in the series to collect and display. Set of all four of the mini dinosaur Fossil Finds, Tyrannosaurus rex, Velociraptor, Stegosaurus and Triceratops. Hours of fun for any budding palaeontologist. Excavate a complete Stegosaurus skeleton out of the plaster block using the specially designed digging tool. Assemble the pieces and construct your own Stegosaurus model. Kit comes complete with fun facts and prehistoric animal quiz (ten sets of questions and answers).Seven models in the series to collect and display. Hours of fun for any budding palaeontologist. Excavate a complete Tyrannosaurus skeleton out of the plaster block using the specially designed digging tool. Assemble the pieces and construct your own model. Kit comes complete with fun facts and prehistoric animal quiz (ten sets of questions and answers).Seven models in the series to collect and display. Hours of fun for any budding palaeontologist. Excavate a complete Velociraptor skeleton out of the plaster block using the specially designed digging tool. Assemble the pieces and construct your own model. Kit comes complete with fun facts and prehistoric animal quiz (ten sets of questions and answers).Seven models in the series to collect and display. Hours of fun for any budding palaeontologist. Excavate a complete Triceratops skeleton out of the plaster block using the specially designed digging tool. Assemble the pieces and construct your own model. Kit comes complete with fun facts and prehistoric animal quiz (ten sets of questions and answers).Seven models in the series to collect and display.